The first item the archivist showed me was actually on her desk as she was just adding it to the catalogue. She explained it was a carriage shawl. 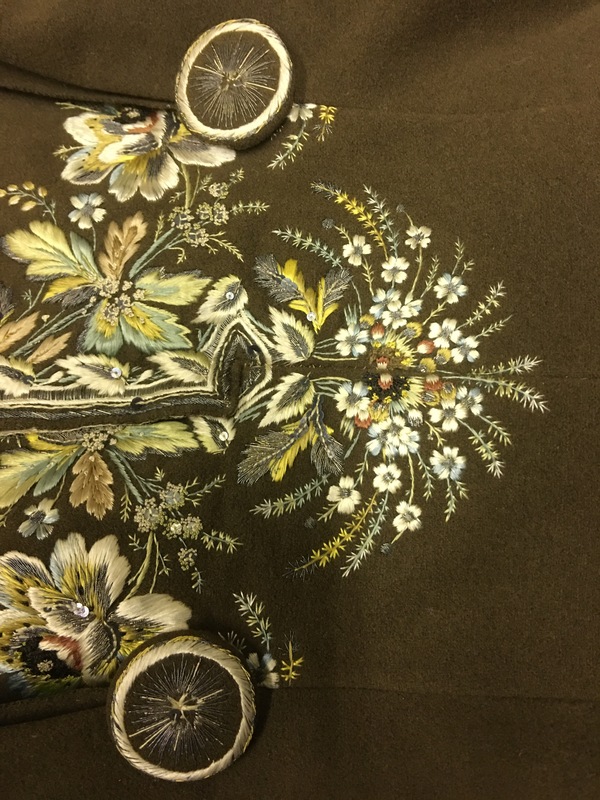 This was a woven linen or cotton material printed with a paisley pattern. It felt lightweight but slightly stiff to the touch. It had several colours within the pattern. It was a large size approximately 2 x 2.5m, in fact too large to be opened up an held up explained the archivist. 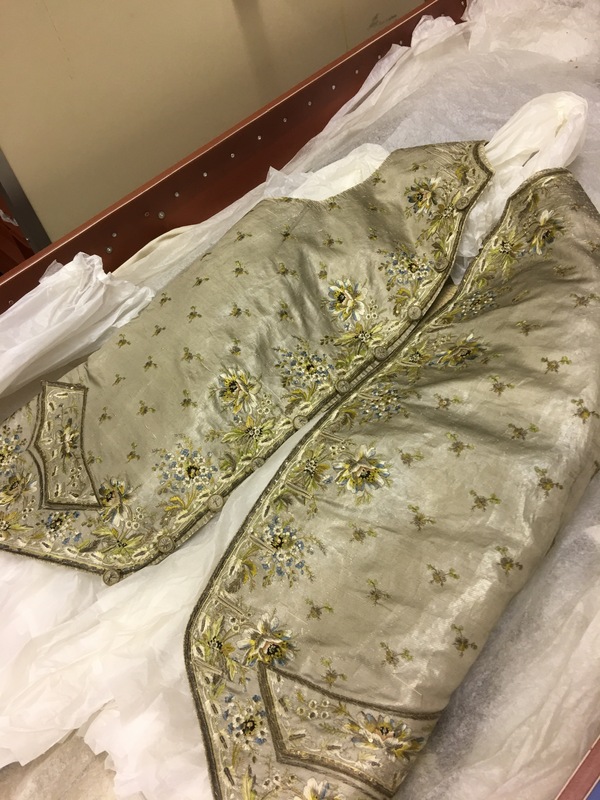 The shawl was gifted to the museum in 2016 and it was believed to have belonged to Mary Fraser who died in 1878. It was though to have been the shawl which she had when married in 1835. Rather than being worn as such, a carriage shawl was used similarly to a blanket, while travelling it would have kept her dress clean while providing some warmth. It was obviously well used as there are several areas of mending where frays and holes have been stitched. 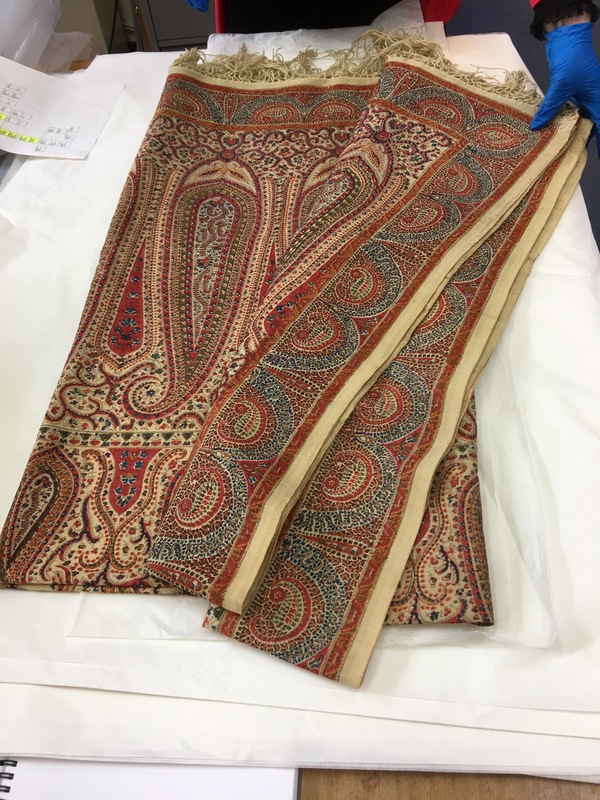 Unfortunately the archive didn’t have much more information than this so I looked a little more into the production of Paisley pattern shawls. From roughly 1800 to 1850, the weavers of the town of Paisley in Renfrewshire, Scotland, became the foremost producers of Paisley shawls. Unique additions to their hand-looms and Jacquard looms allowed them to work in five colors when most weavers were producing paisley using only two. The design became known as the Paisley pattern. By 1860, Paisley could produce shawls with 15 colors, which was still only a quarter of the colors in the multicolor paisleys then still being imported from Kashmir. In addition to the loom-woven fabric, the town of Paisley became a major site for the manufacture of printed cotton and wool in the 19th century, according to the Paisley Museum and Art Galleries. The paisley pattern was being printed, rather than woven, onto other textiles, including cotton squares which were the precursors of the modern bandanna. Printed paisley was cheaper than the costly woven paisley and this added to its popularity. This information fits with that of the museums meaning that the shawl was woven and printed in Scotland. This was a women’s occasion dress. The style was reminiscent of the 50’s with the boat neck, but the archivist felt it was more of a modern copy. There were no tags to show where it was bought or made which made me wonder if it was made to measure. It is a three-layered dress. The first underskirt is made of a stiff papery fabric, the second a white satin and the top is chiffon devore with a black botanical design embellished with sequins. 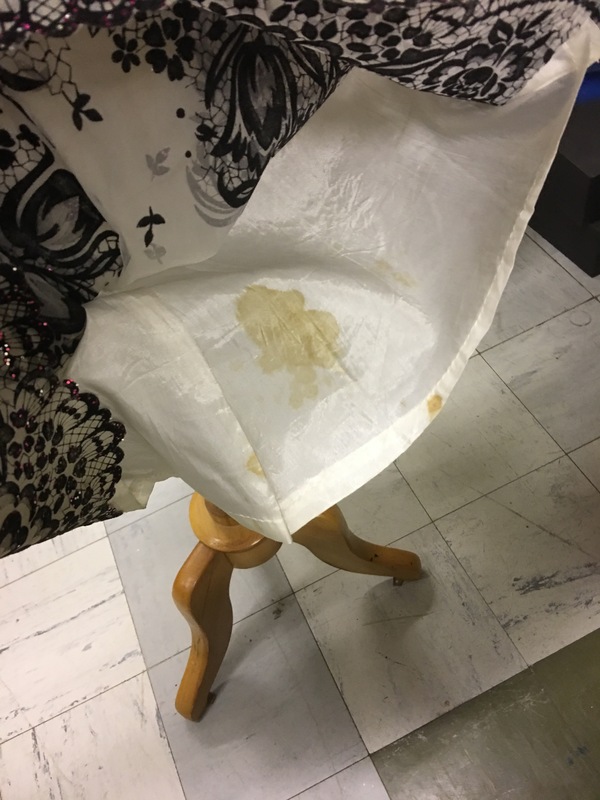 There were obvious signs of wear with yellowing around the inner seams and underarm area and a very obvious stain on the white satin layer. The information held on this item was that it was donated in 1984 as part of a large collection containing approx fifty other items by a Miss ? from Inverness. 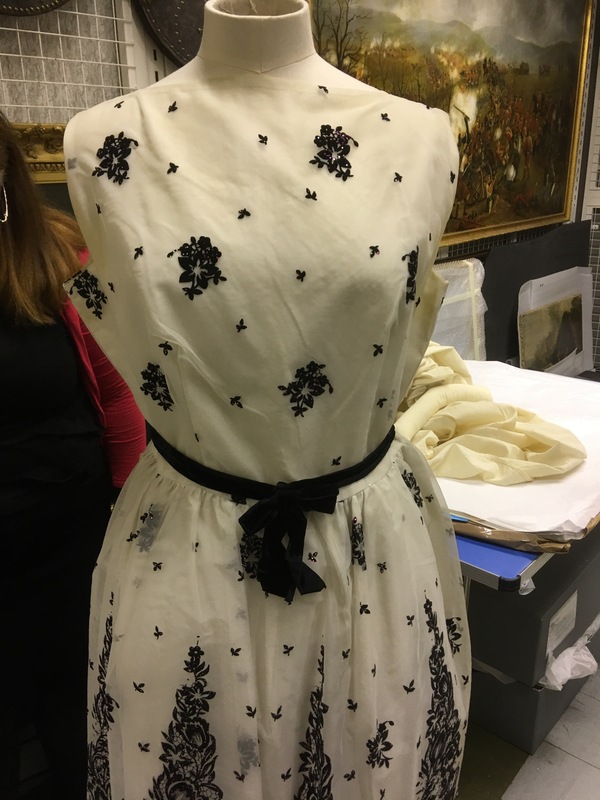 It was an unusual collection containing lots of evening dresses, nursing and maids outfits and two wedding dresses. This led to me thinking of a few stories, could it have been a theatrical wardrobe, or maybe someone who was well-off and ran a nursing home. What else would you need so many nursing and maids outfits for? This was actually two items in a set but I chose to focus on the coat. 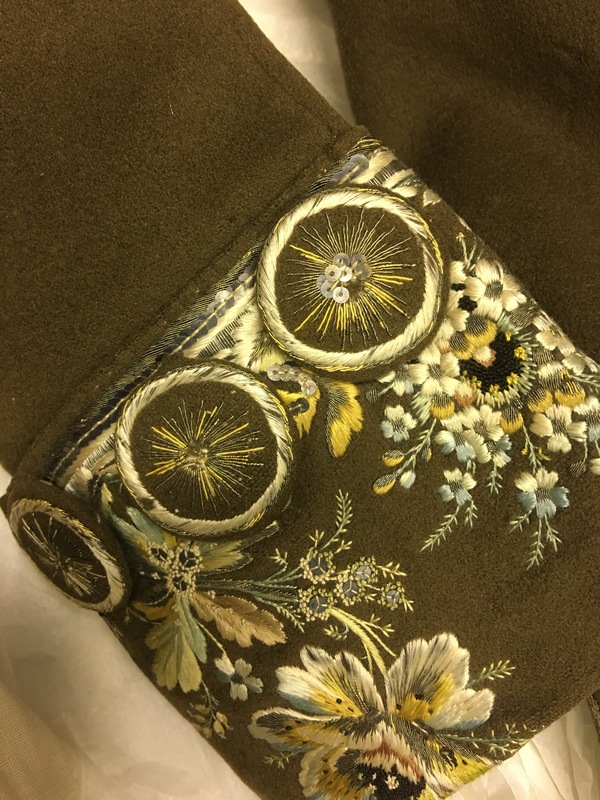 This was a Jacobean embroidered coat and waistcoat. The coat took my breath away the embroidery detail was so beautiful and intricate. 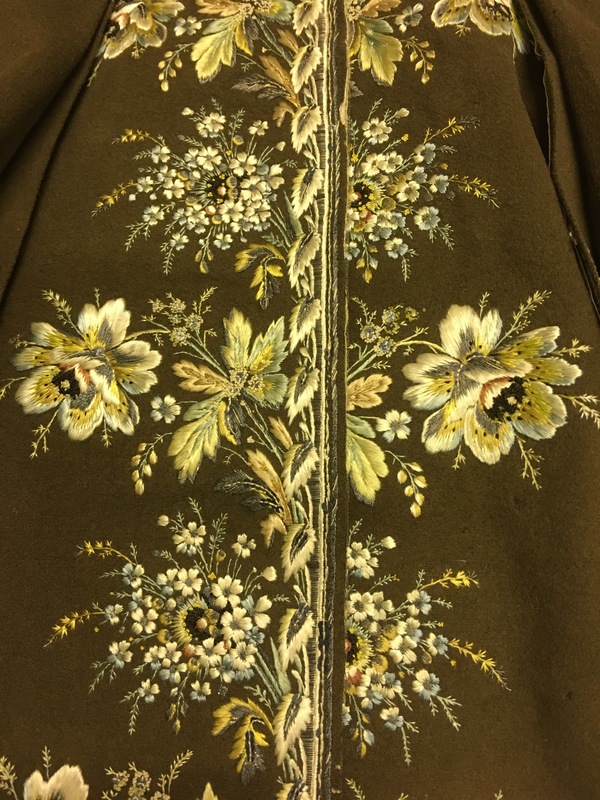 The coat was handmade, green-brown moleskin cotton woven coat with embroidered and sequinned detail. It was very soft and in good condition. 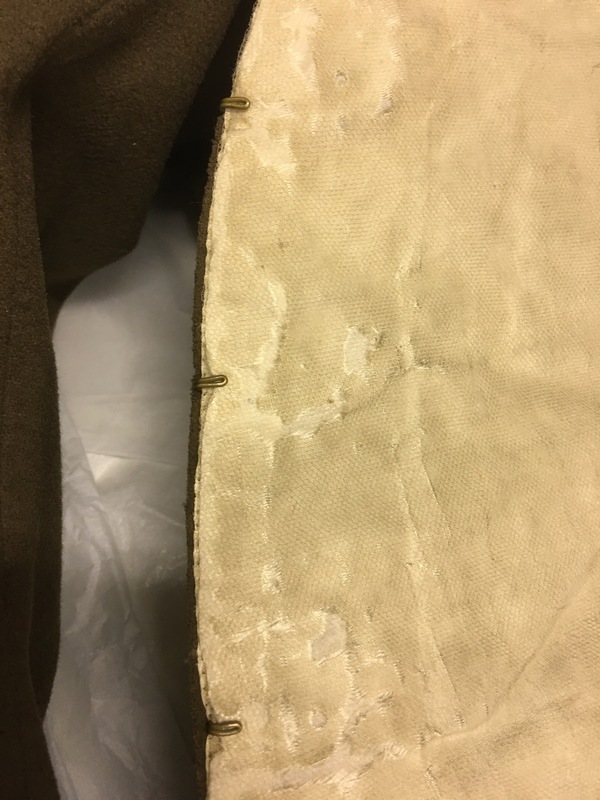 There had been some conservation work done on the silk lining and you could see some small holes on close observation. 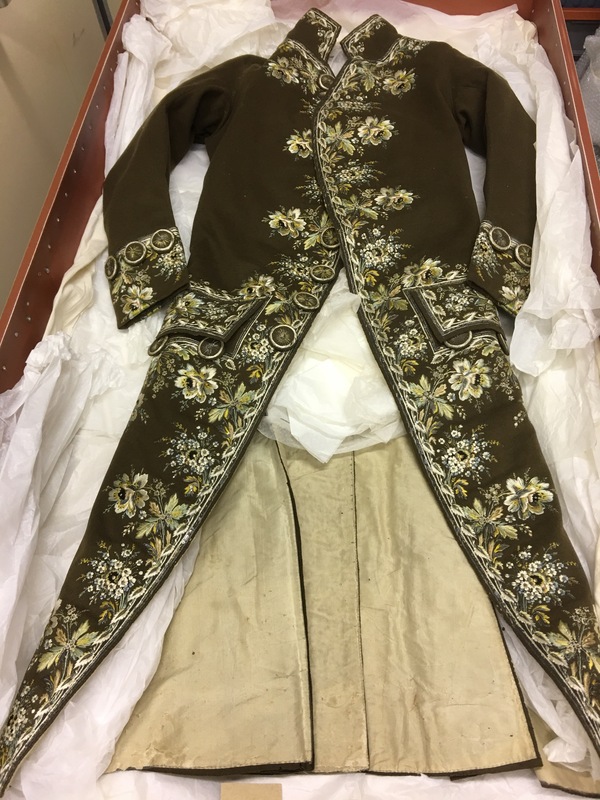 This is a man’s fitted coat with tails and it would have been worn by someone of wealth and stature and would have been worn at court. The story behind it is that it was purchased by the museum in 1929 from an auction house who were offered it from a private buyer. 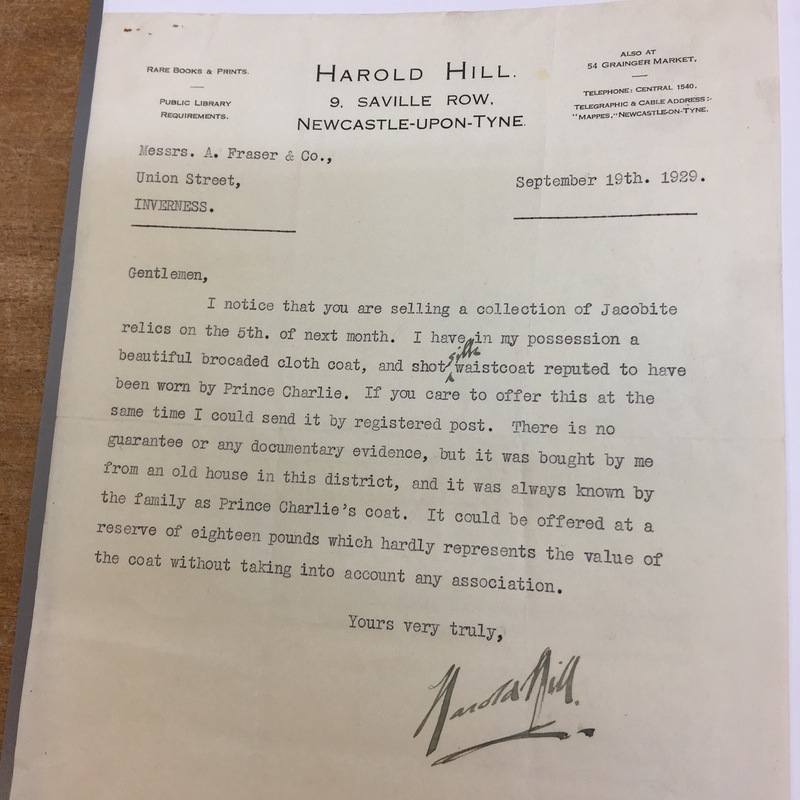 The buyer’s letter is below. 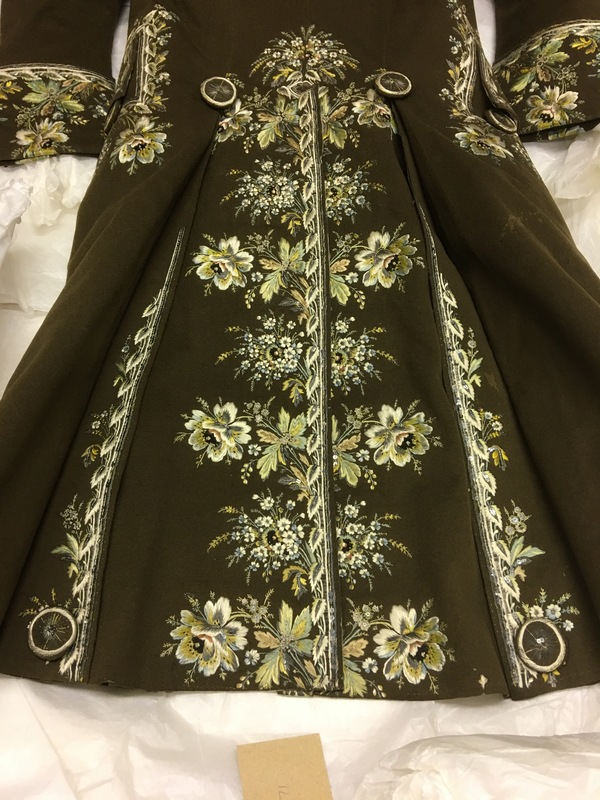 When it was sent for the conservation work to be carried out on it in 1984 it was carefully fitted with a fine mesh net on it’s lining to protect the integrity of the whole coat. 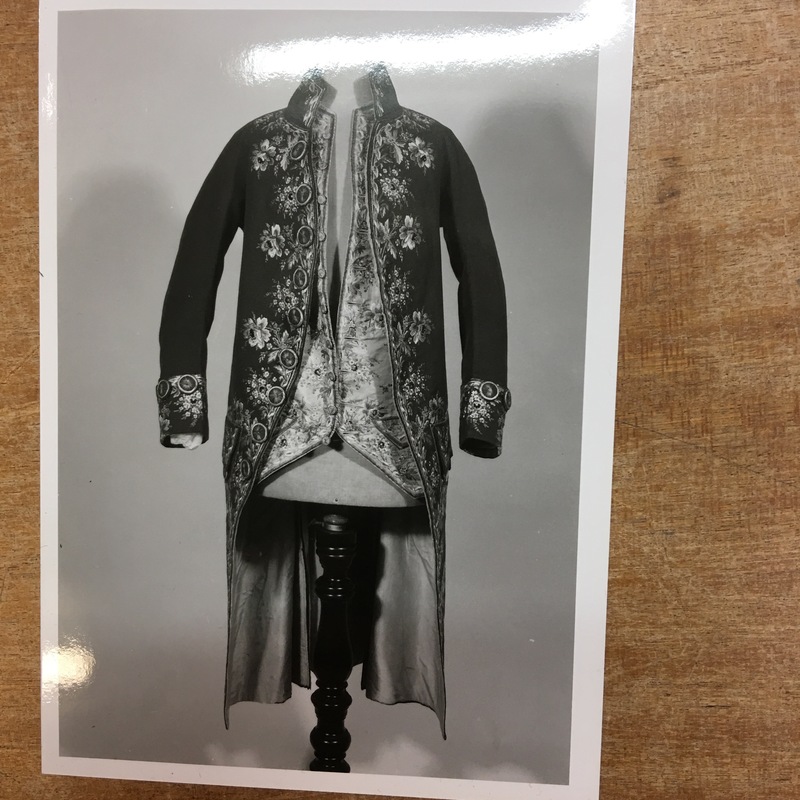 It was considered by the textile conservationist at this time that it was probably from a slightly later period due to its style and decoration and was therefore not Bonnie Prince Charlie’s coat. However it is a beautiful, stunning coat which I would not have been surprised to see walking out on the catwalk of a haute couture collection today.